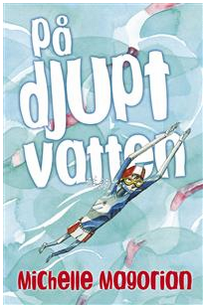 In At The Deep End published by Barrington Stoke is now available in Swedish. Here’s a review by Agneta Warheim for BTJ which is a Swedish Library Journal (with thanks to Maria at Argasso publishers for kindly translating to English). “A very good portrayal of Ben’s development during his long swim. Going into the pool he’s an insecure boy dependent on the approval of his tough friends, who never show up, but as he leaves it he does so with a new-found confidence. Ben is quick to judge the older woman, Betty, but his view changes throughout his ordeal, as she becomes a moral support for him.